Highly concentrated dry body oil that combines a next-generation of anti-ageing ingredients to create the ultimate hand and body oil. Concentrated multi-functional hand cream that targets 8 signs of ageing simultaneously. Contains no acids, no urea and no peeling. Our products solely focuses on repairing cracked skin. "I got this as a part of my Beauty Box and I have been thrilled with it. It leaves my hands soft and nice, and it isn't oily and absorbs really quickly. The smell is pleasant and doesn't linger too strong like a 'fake' sort of smell would. Recommended if your hands need some love!" 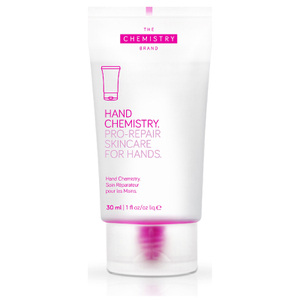 If your sensitive hands are really suffering this season, or if you’re regularly exposed to the frosty conditions, then make sure you pick up Hand Chemistry. Check out our latest customer reviews and feedback from our products. Exclusive to Lookfantastic, try the popular INTENSE YOUTH COMPLEX TRIAL SIZE and RETIN OIL .